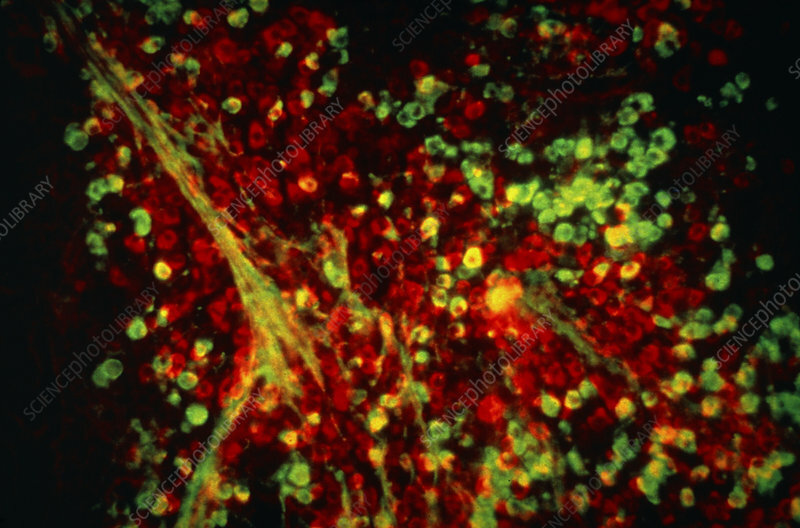 Fluorescence light micrograph of antibody- producing plasma cells in tissue from mouse spleen. These cells are producing two types of antibody protein: the red stained are secreting G (IgG), & the green stained immunoglobin M (IgM). No cell is stained both red & green, indicating the specificity of the immune response. They specialise in producing one sort of antibody only. Antibodies to IgM were labelled with the green dye fluorescein & antibodies to IgG with the red dye rhodamine. The labelled antibodies then bound selectively to cells with the corresponding surface immunoglobins. Magnification x440 at 35 mm size. Microcosmos P.39 fig.